This captivating tale lets young children glimpse what it would be like to fly into outer space, walk on the moon and look back at Earth. Combining illustrations by Benji Davies and real photographs of the moon, this picture book takes young children on an amazing journey into outer space. Available as ebook with narration (on tablets that support audio). Children are still fascinated by the moon and want to know what it would be like to visit it. This excellent first space book invites the reader to join young astronauts as they journey to the moon in a rocket and then use a lunar module to land on the surface. The illustrations integrate photographs from NASA with drawings: some show the moon's mountainous and barren landscapes with grey rocks and large holes. There are also stunning pictures to help young children understand what our earth looks like from space. The illustrations showing domestic settings will appeal to modern children as they see familiar objects, including a dinosaur model. A toy is playfully dressed as an astronaut and there is even a hint of intertextuality - the television screen shows astronauts walking on the moon. A simple but not banal text matches well with the clear, bold line of the illustrations, for example of astronauts taking big bouncing steps on the moon's surface and the writing explaining that the space suits need to provide air as there is none on the moon. The moon is not hospitable enough to encourage long stays: so children see that when the astronauts leave only a small flag and 'some footprints in the dust' remain. This book is excellent I was so pleased with it when it arrived. 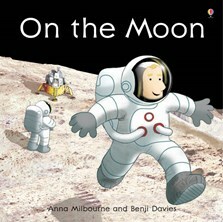 My nearly 3 year old loves the moon and this book helped me talk to her about it. It uses real imagery from the moon. It shows the Earth from the moon too which is a good tool for explaining we live on the planet earth in space. What is great too is that the main character is a girl so we can pretend it is her.